You don’t really need to know a particular language in order to enjoy music. As trite as it sounds, music is a universal language. It communicates through emotions and sounds. Atupa’s sound is one such example of music transcending the barriers of language. Even if you don’t understand a shred of what the boys are rapping about,�you’re still in for a good listen. 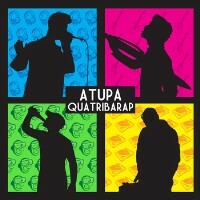 QuatribaRap was released last July 2012 and it’s currently offered absolutely free over at the group’s BandCamp page. QuatribaRap is a meeting ground of sound. From rap, hip hop, dub, funk and bass; the record brings together all these elements and transforms them into catchy tracks. The group cites that they hope to create a meeting ground for the burgeoning rap scene in Valencia and from the sound of things they’re certainly off to a great start. After a short 40-second intro, the album gets it on with the title track, QuatribaRap. It’s a track that stands on solid ground, built on a foundation of dub, synths and catchy hip hop groove. Even though you might not understand the language, there’s no denying that these boys have rhyming skills worth showing off. Overall, Atupa is an awesome group to check out. QuatribaRap presents quite a handful of engaging tracks that’ll easily make a fan of any random listener. Don’t hesitate to listen in. The beats and general rhythm should be enough to help you decide if this is right up your alley. Definitely worth the grab.